Dead City Ruins told Est.1987 that “we always play our asses off, if there is 1000 people or no one we still do our best to destroy ourselves!”. And they certainly lived up to that reputation as they took to the stage at The Well in Leeds. With influences ranging from Motorhead to Black Sabbath, Thin Lizzy and beyond the Anglo-Aussie five piece are storming through the UK on their European tour. Dead City Ruins are a band that definitely aren’t afraid of hard work; after relocating from London to Melbourne the band set about to redefine themselves and come back bigger than ever. They are determined to make their mark in Leeds this evening; the introduction alone does that. The heavy riff-laden guitar instrumental, the band’s long hair in-sync flowing back and forth drives the set into action as lead singer Jake struts onto the stage. The hard hitting “Where Ya Gonna Run” is typical of Dead City Ruins’ sound; extensive classic based rock riffs and raw vocals tipped with melodic, soaring choruses. Lead guitarist, Tommy leads the band with his water tight and impressive playing, boundlessly running up and down the stage from start to finish. Lead track from the band’s album, “Midnight Killer”, pulls back the verses whilst the choruses are fast paced and driven, while the infectious album track “Damn My Eyes” is undoubtedly the crowd favourite. Dead City Ruins also debut new song “To The Bed” showcasing the quintets knack for writing rock anthems which make way for heavy breakdowns. The band aren’t afraid to give their all to the live show and enjoy regaling the audience with tales from tours gone by. “Twenty chavs attacked our van last time we were in Leeds”, laughs Jake before releasing the song which the band wrote after that incident on the crowd here tonight. 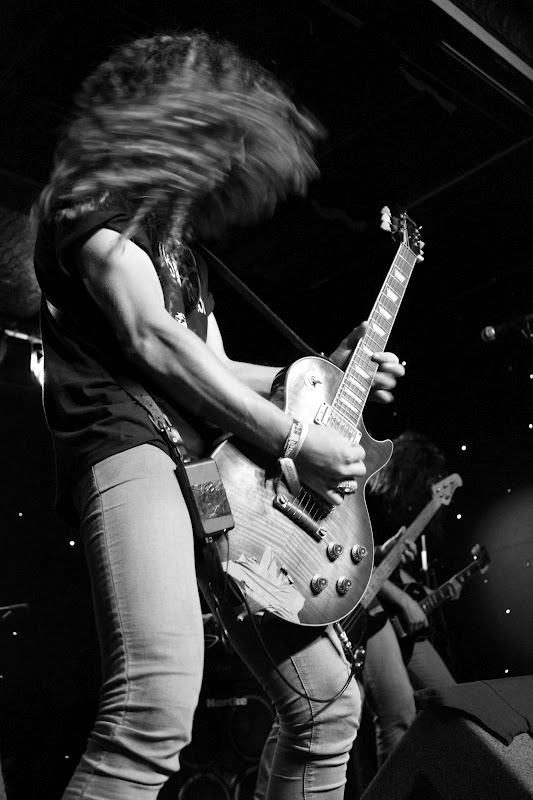 “Broken bones and bloody fists” chants Jake as the song’s driving rhythms and catchy lyrics reflect how the band are adding their own flavour to the game of rock. 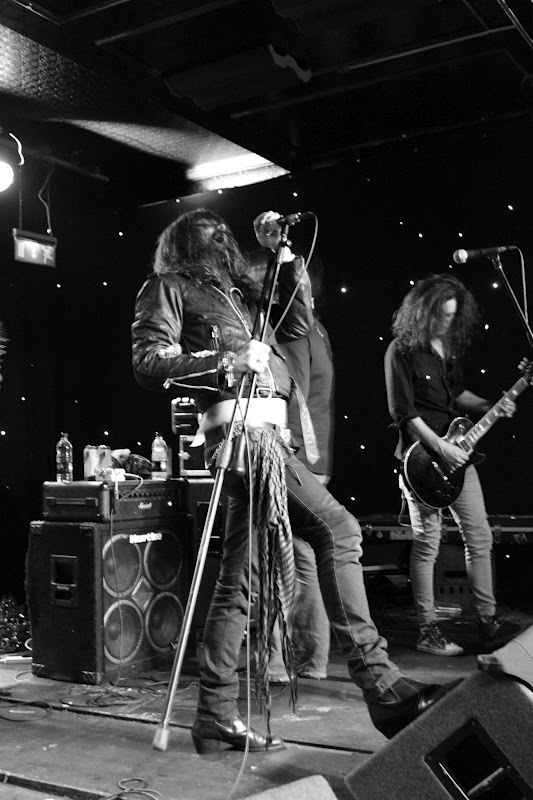 Dead City Ruins aren’t short of ambition; their on stage presence is mesmerising. 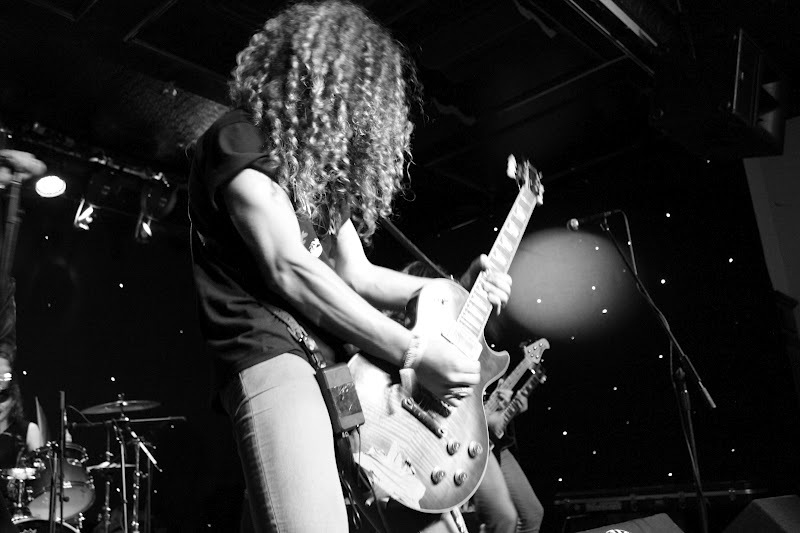 Their energy level is unfaltering and holds the audience’s attention throughout the set. 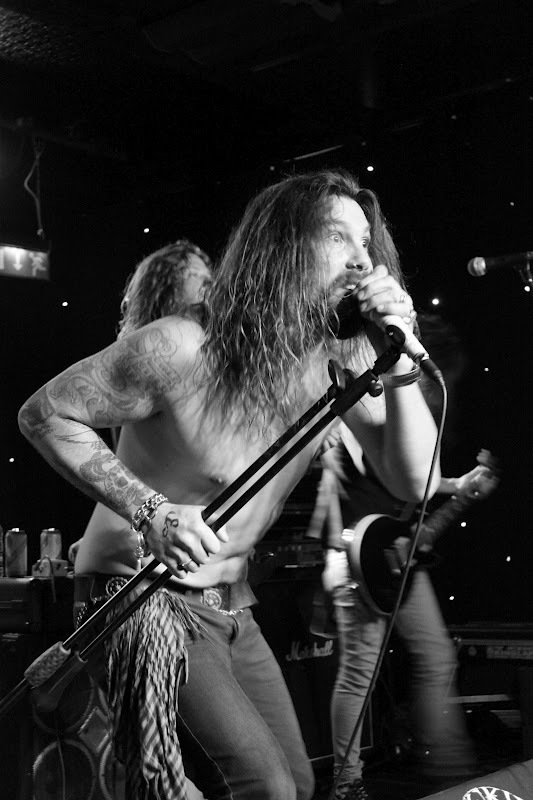 Lead singer Jake teases the audience, lurching forward with his mic, whilst Tommy jumps off the stage playing his guitar down within the crowd. The band’s tight set, catchy hooks, long hair and denim ensembles all add to their vintage rock appeal. On record Dead City Ruins’ rock rhythms, with intricate riffs and soaring vocals, are often lost in a slight repetitiveness. However, the band work hard to invigorate the songs, bringing a new life to them. The band’s stage show is high octane and pulls you in and really must be experienced to be believed. 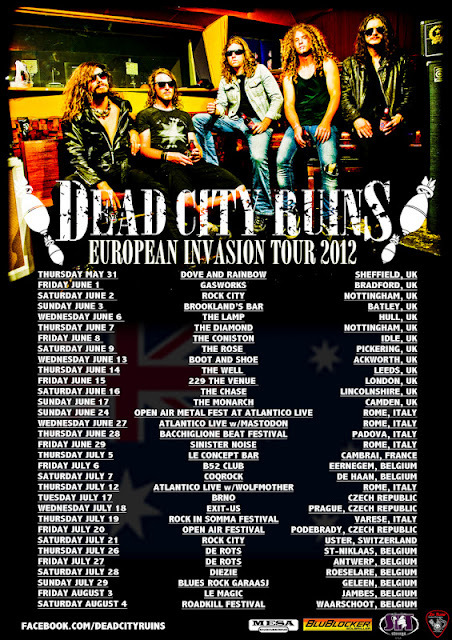 Dead City Ruins are definitely a band to check out live. For the full interview with Dead City Ruins click HERE.